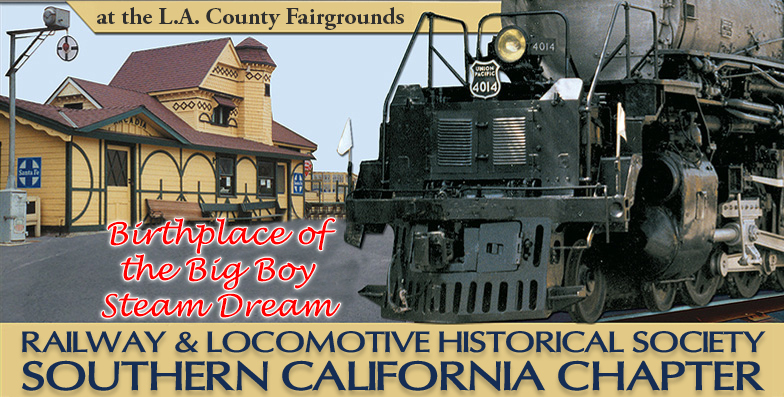 Birthplace of the Big Boy Steam Dream, and home to the RailGiants of Southern California’s premier railroads! RailGiants Train Museum at the Los Angeles County Fairgrounds in Pomona, California is a historical journey back to the glory days of the American Railroad. Our Museum houses some of the country’s most well preserved Locomotives, which includes several sole survivors of their respective classes. Our RailGiants collection contains two of the four surviving 3-Cylinder steam locomotives; SP #5021 and UP #9000. The largest diesel locomotive, a Union Pacific “Centennial” is also here. In addition to our locomotives we have various pieces of Rolling Stock (freight and passenger cars), our historic Arcadia Depot, Library Archives, and Gift Shop. We are open free to the public during the second weekend of each month, except in September, from 10am to 5pm. Ample parking is available. During September, we are an exhibit inside the Los Angeles County Fair, which requires paid admission. Please check our Event Schedule. Watch a sneak-peak of what you'll see during your visit. I heard great things about your Steam Echoes II CD. Where can I buy one? Or order on our website. When is RailGiants open next? When is our next Rail Meeting? Where is Big Boy Locomotive #4014? See Big Boy News page for more information. Click here for updated news.